How Can Thermal Imaging Help Find Water Intrusion? Homes are frequently plagued by problems such as stained walls, peeling paint, or sudden leakages, in the monsoon season. There are multiple ways water can seep into the walls of your house – wear and tear, structural deficiencies or a leak in the drainage system. But is that a major cause for concern? Yes! Water seepage not only affects the outlook of your house and drives down property value, it also causes irreparable harm to the residents’ health. Moisture between walls creates an ideal breeding ground for the bacteria. Microbial organisms thrive in damp, moist conditions – conditions created in a seepage-affected house. In addition to bacteria, the most severe health threat due to water intrusion in the house is the formulation of mold. The mold formulation is proven to lead to respiratory illnesses and allergic reactions. Research conducted about the effects of water damage concludes that dampness and leakages also lead to an increased number of pest allergens. For asthma patients, this situation presents a real threat to their health. Detecting the source of the water accurately is crucial to determine what is causing the water to seep in and harm your house’s overall structural integrity. Concealed pipes often cause leaks and seepages beneath your walls, which makes it impossible for the naked eye to detect and further treat the source of the problems. Advances in technology have enabled professionals to use innovations to detect the sources of such seepages and leakages – such as Thermal Imaging. Thermal imaging is a technology that utilizes infrared cameras to record minuscule variations in the temperature of a surface or an object. Images captured by the thermal cameras show such variations in temperature in contrasting colors – it shows relatively lower temperatures in darker colors and higher temperature in lighter colors. Unlike a moisture meter that searches for moisture inch by inch, an infrared camera using thermal imaging can scan an entire room in a couple of minutes. A thermal camera does not ‘see’ the moisture, but rather it detects the varying temperatures across the surface. The evaporative moisture cools the surface, creating a unique thermal pattern which is detected by the thermal camera. Contrary to common perception, thermal imaging has been around since WWII, but high costs and extensive training required to use the technology was a key factor why thermal imaging took so long to get in the home inspection industry. A thermal imaging camera can help find many types of water intrusion and defects in an architectural structure with a concealeddrainage system, such as apartments and houses. Thermal imaging can be used to treat some of the most commonly found problems that lead to moisture and dampness in the walls or roofs. This article will list some of the problemscausedbywater intrusion and how thermal imaging can be used to counter such problems. Roofs are our barrier against the heat, rain, and snow. They shelter us and are an essential part of any residence, highlighting the need to maintain roofs in optimum condition. A perforated roof, one that has a leak or a ‘hole’ from which water leaks by poses a threat to the overall strength of the structure. Water is capable of finding its way even through the smallest of the holes or perforations in a roof. Only identifying the source of the perforation is not enough, as the damage caused by the leak can be several meters away from the perforation identified. Thermal imaging has the advantage of identifying the location of the said perforation, but also of the areas affected by the water seepage. In case of roof leaks, it is imperative to identify the affected areas and ascertain the level of decay that the seepage has caused. The leakage not only affects the appearance of the roof but also weakens its structure, posing a grave threat to the residents that live there. Thermal imaging can help identify the maintenance level of the roof, and potentially save you thousands of dollars in roof repairs before moving into a new property. Modern homes are incomplete without insulation, and it has become a part of building regulations and compliance guidelines. However, sometimes a part of the house’s structure is missing insulation or the insulation installed in the house is not inadequate. Due to a lack of ventilation in the insulation layer, there is no way for moisture to ever dry out. If the moisture or water has made its way past the roof, it will cause the insulation layer to deteriorate and shorten its durability and effectiveness rapidly. 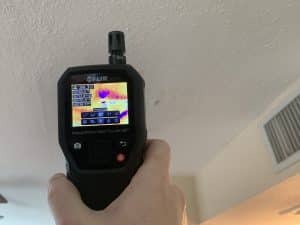 Thermal imaging can identify the location from where the insulation layer has inflicted the most damage as well as the leaks from the roof causing the insulation to rot. By revealing the difference between the dry and wet areas of the roof, thermal imaging helps identify areas that need repairs. Pipelines are concealed between the walls and layers of concrete. Any leak from the plumbing system is often left undetected until it is on the verge of major damage. Additionally, you can also trace the damage caused by faulty pipelines several meters away from the source of the leak. Conventional methods such as moisture meters prove to be unsuccessful in tracing such damp and moisture accumulation happening beyond the naked eye – reiterating the importance of a thermal imaging inspection for your house. Thermal imaging can detect temperature anomalies in the plumbing system that are not visible to the naked eye. Thermal imaging has proven to be an upgrade to conventional methods of a home inspection – providing a more accurate and reliable image of where water intrusion has led to needing repairs, saving thousands of dollars in the long run for any major damage caused by negligence.